In 2004 I came across a description of the Argentinian training cruiser La Argentina, which was built between 1936 and 1939 by Vickers of Barrow. A brief mention was made that the ship was armed with one-inch Vickers AA guns. I was puzzled by this, as the only Vickers one-inch guns I knew were produced during WW1 and were low-velocity aircraft weapons which would have been of little use in the AA role by the 1930s. So I made some enquiries via the ECRA network, and details of an almost forgotten weapon gradually emerged: the 25.4mm Vickers, which fired a unique 25x189 rimless cartridge. 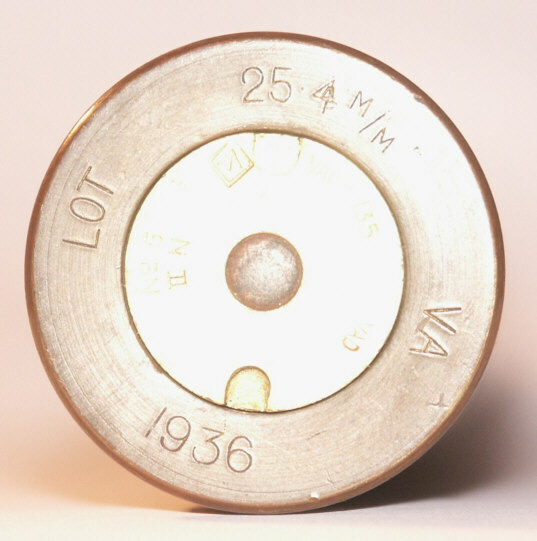 Subsequently, the picture became further confused with the appearance on eBay in May 2007 of an entirely different round also called the 25.4mm Vickers, this time a rimmed 25x95R round dated to 1935. Finally, two other Vickers cartridges with the 25.4mm designation are known. One has a rimmed case 146mm long, while another has a rimmed 112mm case. This article aims to unpick the stories of these rounds and the guns which fired them. 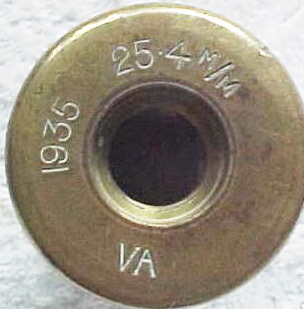 It is noticeable that the dimensions of the 25x95R are very close to those of the Great War era Vickers 1 inch round (25x87R); the rim and case diameters are the same, only the case length being 8mm longer (the difference possibly being in the neck length, although that is not certain from the published information). 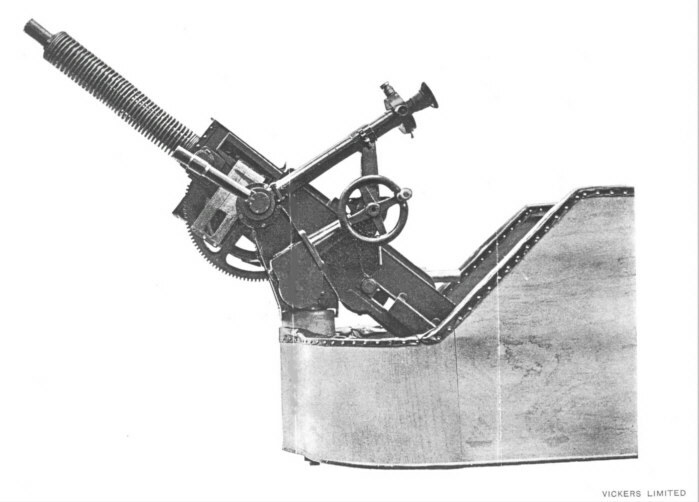 The 1 inch round was developed for a compact automatic belt-fed gun (shown on the right in a Great War aircraft mounting) which was initially developed by Vickers in the UK (an example survives in the National Firearms Centre), but only manufactured in Italy by Vickers-Terni and (judging by a photograph) fitted to at least one Italian bomber (N.B. this was not the same gun or ammunition as the 25.4mm Revelli-FIAT). After the war some were sold to Sweden for arming submarines: the Swedes gave it the designation 25mm Kulspruta M/22, and it was apparently still in service in 1937 because it was at that time renamed the 25,4mm apjäs M/22 (kulspruta = machine gun, apjäs = automatic piece). It therefore seems possible that this 25x95R Vickers round may have been made to a Swedish order for ammunition for these guns. That suggestion does, of course, rely on the extra case length not affecting chambering in the guns. If so, one can only speculate about why the case length might have been extended – possibly to provide a more secure grip on the projectile. Unless further information can be discovered, this can only be speculation. It is worth noting that the case dimensions of the 25.4x95R are almost exactly the same as the 19th century 1 inch Nordenfelt round (25x94R) for a hand-cranked multi-barrel gun. 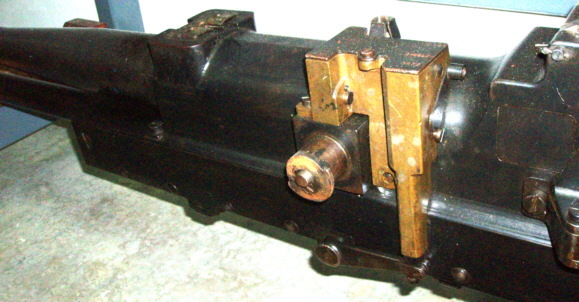 The Nordenfelt case, with the addition of electric priming in most production, was subsequently used for the British 1 inch Aiming Round for a sub-calibre training barrel. The photo below shows the 25x189 (top), the 25x87R (middle) and the 25x95R to approximately the same scale. The photo on the right shows the base of the 25x95R round sold on eBay in 2007. The gun is simply referred to as the ‘Vickers 25.4 mm’, presumably to distinguish it from the earlier Vickers 1 inch, although thereby causing confusion with the 25.4x95R and 25.4x112R and 25.4x146R cartridges described in this article. 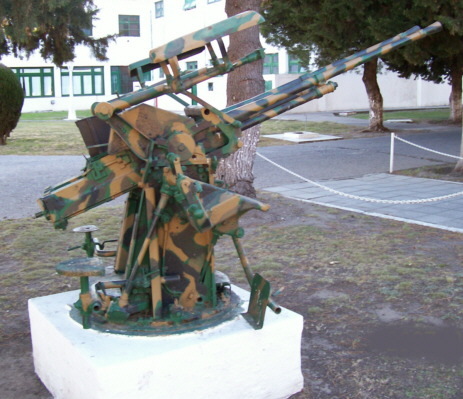 It appears to have been developed in the early to mid-1930s specifically as a naval gun, and was only ever produced in a fixed twin mounting. I am unaware of any other application of this gun apart from La Argentina, which had six of these mountings. 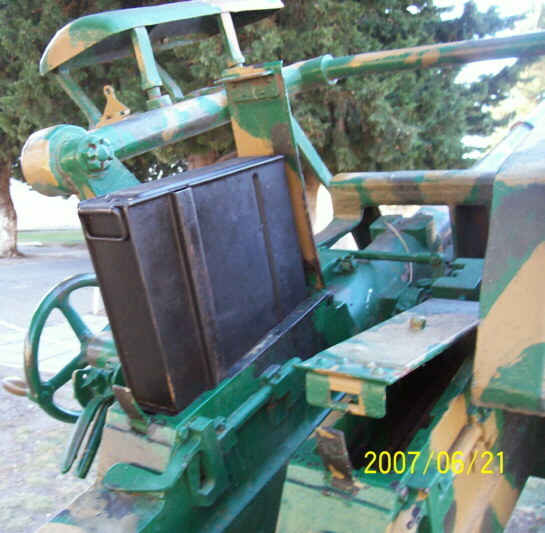 One gun (without mounting) still survives in the MoD Pattern Room at Leeds, and a mounting is on display outside a naval base in Argentina. 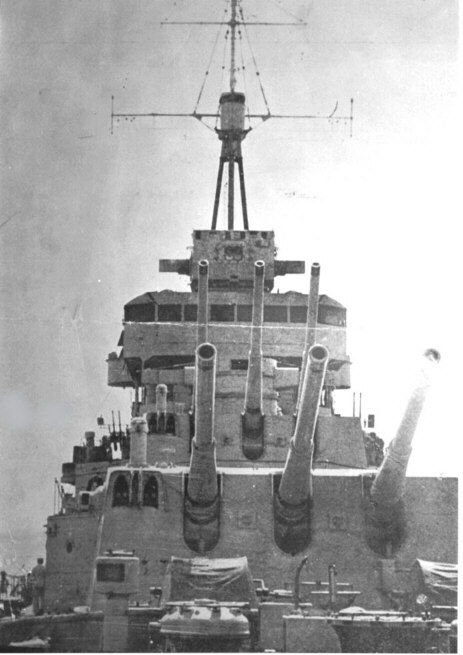 The mountings were removed from La Argentina in 1949 and replaced by six single 40mm Bofors mountings. The photo of the mounting (top left) is from the Barrow Museum in Cumbria, which contains much material concerning Vickers (for a long time the town's biggest employer). They have six different high-resolution photos of this mounting available for purchase as photographic prints: they may be viewed on-line and ordered from: http://www.dockmuseum.org.uk/archive/index.asp (enter 25.4mm in the 'search' box). The photo of the cruiser (top right) was kindly supplied by A.A.C.A.M. (see credits at the end of the article) and shows two of the 25.4 mm twin mountings, barrels pointing skywards; one on each side of the bridge, under the bridge overhang. The entire starboard mounting can be seen, but only the barrels of the port mounting. The three photos above and to the right, of the mounting outside an Argentinian naval base, were kindly supplied by Horacio Alejandro Tejada. The four photos of the gun (below) are courtesy of the National Firearms Centre. The guns look very different from the traditional Vickers large-calibre automatic guns of the period, which were belt-fed, water-cooled and recoil-operated. They are obviously air-cooled, gas-operated, and are fed by box magazines above the breech. Since Vickers was offering the gas-operated, magazine-fed Vickers-Berthier .303 LMG at that time (it was used by the Indian Army instead of the Bren), and the Vickers K or VGO aircraft gun derived from it, it seems reasonable to theorise that the 25.4 mm gun used a scaled-up version of this mechanism. The cartridge for the 25.4mm gun is a slender, rimless, bottleneck type with a case length of 189mm. Two different types of projectile are known; an APC (as shown in the first cartridge photo above, and in detail on the right) and an HE shell for which information and illustrations have been provided by A.A.C.A.M. 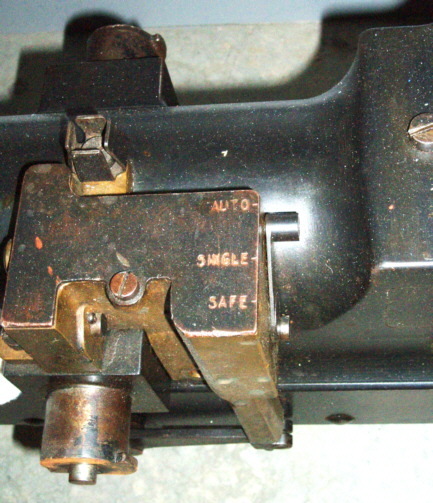 The photo of the base of the cartridge (far right), showing the headstamp, is of the APC round. The nose-fuzed HE projectile (below) retains traces of red paint. According to the official drawing shown later, it weighs 260g. According to the gun manual, the cartridge weighed 550g and was 256.5mm long. The propellant load weighed 86.74g. The muzzle velocity with the 250g projectile was 914 m/s (3,000 fps), which equates to 104,000 Joules. This is effectively the same as the contemporary 25x163 Hotchkiss AA gun round (250g @ 900 m/s = 101,000 J) and the current 25x137 NATO (180g @ 1100 m/s = 109,000 J). The cartridge case is brass, with a dark coating or patina, the primer also brass but much brighter, as shown in the photo above. “In the A.A.C.A.M. own reference collection, we have: one cartridge that was obtained from a retired navy non commissioned officer, who worked in the naval museum, and as he told us, some years ago he got some cartridges from crates of ammunition that were to be dumped at sea. It bears the headstamp: VA AR (Argentine marking that means “ARMADA” – navy -) 1938 LOT 8 25.4 M/M. Markings were at 12-3-6 and 9 position. The projectile bears in the fuze the marking: L10 1939, and in the body 25.4 M/M VAD 1939. The projectile has traces of red paint, we presume this is the original paint. The explosive seems to be Trotyl, because the denomination found in this blueprint A.E.A.T. means: GranadA Explosiva Antiaerea Trotyl. According to the blueprint 3.8 % of the projectile weight (without fuze) is explosive material. Also, one case was obtained from the “Fray Luis Beltran” ammunition factory. Unconfirmed reports said that was there for fatigue material testing, it bears the headstamp VA AR 1938 LOT 3 25.4 M/M, and most interesting is the primer (Argentine made) with the following markings: A.A.M.Z. 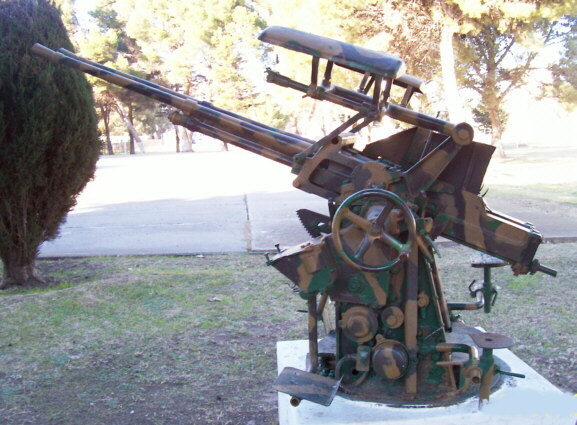 /57 PP-21, meaning that it was made by the Arsenal Artilleria de Marina Zarate (Zarate Navy Artillery Arsenal) probably in 1957. Our speculation is that once the supply of British made ammunition was exhausted, the navy maybe tried to reload it with Argentine-made components. Whether other components (beside primers) i.e. projectiles, were made in Argentina is still matter of investigation. This fact is very interesting, because if the MGs were replaced in 1949, and in the year 1957, A.A.M.Z. was making primers, this means that somebody was still using the MGs: who, where and when is still a mystery to us. "It was reported that these guns were tested at AAMZ to be later transferred to other ships (probably coast guard) but a deadly accident happened caused by premature detonation of the projectiles and they were no longer considered for future service." 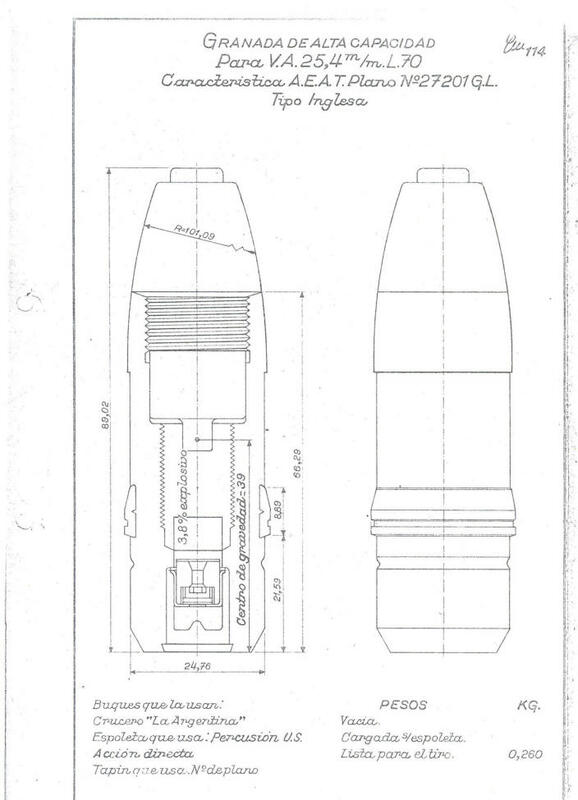 In "Spitfire, the History" by Morgan and Shacklady (Key Publishing Ltd, 1987) there is on page 61 a table of alternative armaments proposed for the Spitfire during its design/development phase. Included in these (rather surprisingly) is a 25.4mm Vickers. The data quoted for it match up almost exactly with the 25x189 gun and ammunition: a shell weight of .551 lbs (250 g); a muzzle velocity of 3,000 fps (914 m/s); a gun weight of 127 kg; and a length of 259 cm. There are two differences: the gun is stated to use a 30-round drum magazine (presumably developed specifically for the aircraft application where reloading would not have been possible), and the "weight of shells per minute (max lbs)" which is given as 55 lb (25 kg). This is only equivalent to 100 rpm, just half that stated in the Handbook, and even without that source appears far too low given that the contemporary Bofors 25mm fired at 160-180 rpm and the 25mm Hotchkiss at 200-250 rpm. So the book, or the source document used, appear to be in error. The cartridge case for this ammunition is described and illustrated in Peter Labbett's book British Small Arms Ammunition 1864-1938. 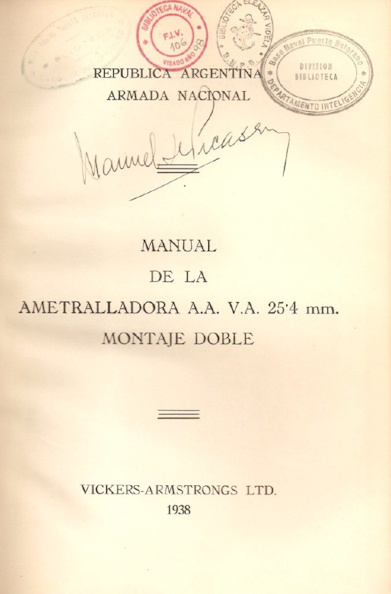 The rim diameter is given as 34.56mm (compared with 31.5mm for the 25x87R) and the illustrations of the case plus a drawing of the headstamp in the book are shown below . The inclusion of VA in the headstamp shows that it is a Vickers Armstrong case, but the meaning of SC is not known. Nothing more is known about this round. The complete round shown on the right turned up on the IAA forum in November 2012 (thanks to "Buster" for permission to use his photo). The case length is 112.45mm and the rim diameter is 34.35mm. 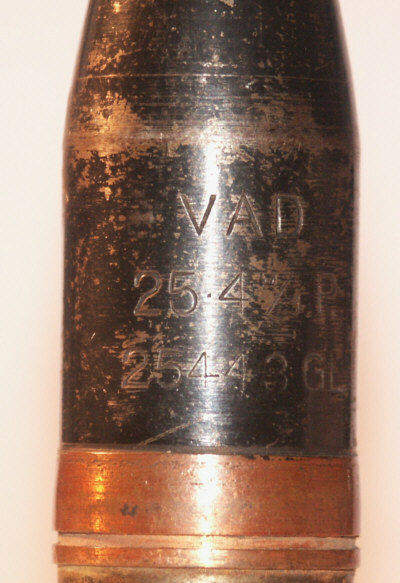 The case has no headstamp, but the projectile is stamped 25.4 m/m VSM (Vickers Sons & Maxim). Nothing more is known about this. The guns these round were intended for are not known. 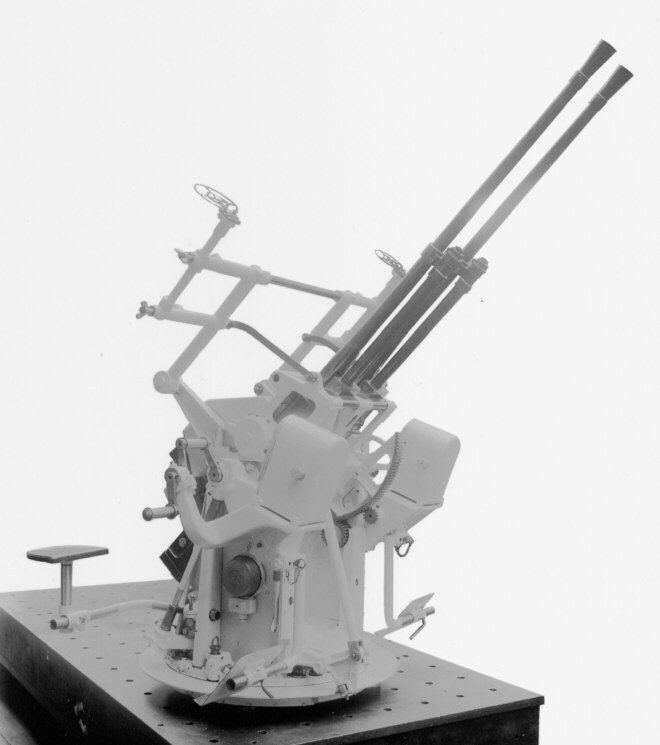 There are two 1930s Vickers gun developments in this calibre for which the ammunition has not been identified: a dual-calibre artillery piece and an automatic gun. During the interwar period there was a brief fashion for dual-calibre infantry light artillery pieces, with each gun having two barrels which could be used according to the targets: a small-calibre high-velocity one for anti-tank purposes and a larger calibre low-velocity one for lobbing HE shells. Several makers produced such weapons in various calibres, some with interchangeable barrels, others with the barrels stacked vertically. Vickers is known to have developed one with 25.4mm and 70mm barrels. In this case, the smaller-calibre barrel was designed to slide inside the larger one, so used the same breech. The 25.4mm fired a 250g projectile at 750m/s, the 70mm a 4kg projectile at 213m/s. The muzzle velocity is quite high, suggesting that the 25.4x146R round is the more likely candidate. 2 - The type of action is the usual barrel recoil operated mechanism of the Vickers system with belt or link feed. 4 - The gun will fire at the rate of 200 rounds per minute. 5 - The inboard length of the gun will be approximately 36 inches. - High explosive shell with sensitive fuze. - Night Tracer projectile with internal night tracer. While, if required, a hollow shot brought to weight could be supplied. This is clearly a completely different gun from the 25.4mm naval AA gun supplied to Argentina which is described above, as that was gas-operated, air-cooled and magazine-fed. Finally, it should be acknowledged that there were other projects for "1 inch" (as opposed to 25.4mm) guns discussed in the 1920s from Vickers or its Elswick subsidiary. However, very little is known about them, and nothing about their ammunition. A note on nomenclature: Vickers started by using Imperial measurements for this calibre (i.e. 1 inch) but later switched to the metric equivalent of 25.4mm. Possibly this was a general changeover from a specific date (which would seem to be around 1932) or perhaps they used the metric designation for weapons intended for export - that is unclear.